Tanned leather decorated with gilding, applique, openwork and incising. A pair of flat, dark, leather slippers. Egyptian ca. AD200-500 (possibly). Made using the turned technique. Decorated with gold leaf, openwork and incising. This pair were acquired from H. Wallis Esq. 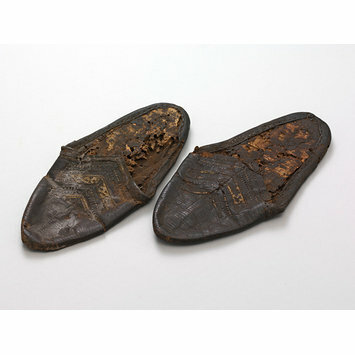 Coptic footwear was generally made of leather, primarily using the turned technique to produce a slipper or shoe with a straight sole. Slippers often included a rand at the vamp and a fibre padded sole sewn together with prominent stitching or insole tab. They show variation in the form and height of the instep. Shoes were generally slip-ons and also show variation in the form and height of the instep. Footwear was highly decorated in geometric and floral designs. Often a variety of techniques were used in combination with the most popular being dyeing, gilding, openwork and appliqué. An incomplete pair of flat, dark, leather slippers. ca. AD200-500, Egyptian (possibly). Semi-pointed toe and round heel. Turned technique. Treadsole: Straight. Sole stitiching is shaped like a V leading to an oval leading to a small teardrop. Turned at tread while perimeter of waist to seat edged with separate strip of leather (13mm wide). It follows up round edge of vamp edge a short way. Stitched with running stitch. Midsole: Layers of papyrus. Insole: Dark leather. Upper: From toe to mid-vamp are horizontal incised lines then V shaped incised lines; then a V line of gilded, applied leather (stitched through central line); then two V lines of square, openwork threaded with gilded leather; One thicker V line (10mm wide) of gold leaf with cutout triangles; Two lines of V square, openwork threaded with gilded leather; final thicker (5mm wide) V line of gilded leather. Edged end with thicker leather strip from sole. Vamp ends over instep with a high throat and may have had a circular knop at the point. Objects 2-1888 to 9-1888 bought together for £12, from Henry Wallis. A pair of dark leather slippers, ca. AD200-500 (possibly), Egyptian; Akhmim (probably); Decorated with gold leaf openwork and incising.